Today, Roger Ruegger pointed out to me that The Crossing is being presented by IWC on their website. The Crossing has been played in front of 1700 guests during a gala night organised by IWC at the SIHH watch fair earlier this year. “IWC presents the short film of a multimedia performance by the Sydney Theatre Company, interpreting the story of how the watch manufacturer was founded and starring Cate Blanchett and Joseph Fiennes. 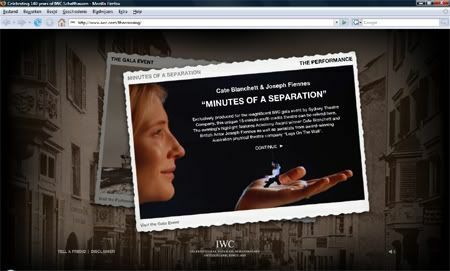 The watch manufacturer IWC Schaffhausen is celebrating the online premiere of ?¢Ç¨?ìMinutes of a Separation?¢Ç¨¬ù, with the lead roles played by Oscar winner Cate Blanchett and Hollywood actor Joseph Fiennes. The ?¢Ç¨?ìMaking-of?¢Ç¨¬ù, which contains interviews with Cate Blanchett, the director and other actors, provides a fascinating look behind the scenes. Have fun. 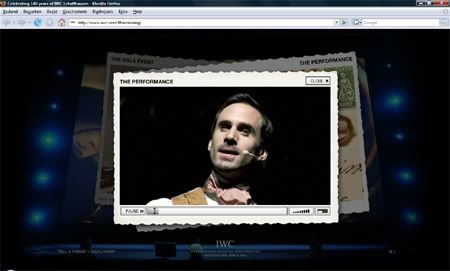 Click here to go to IWC’s microsite ‘The Crossing’.